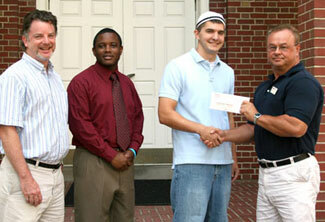 Wabash College students, faculty, and staff have raised $3,316.93 for Hurricane Katrina relief. Sphinx Club president Doug Berry ‘06, MXI’s Nikeland Cooper ’06, and Professor Stephen Morillo presented the check Wednesday to the local Red Cross. Students rallied to the relief cause after the Aug. 29 hurricane. The Sphinx Club arranged to have New Orleans native Morillo give a chapel talk Sept. 8 where more than $2,700 was raised. Additionally, member of the College’s Malcolm X Institute, which has several members from the stricken area, have been selling wrist bands for hurricane relief. Cooper said the MXI had sold more than 1,000 of the bands but still has about 900 for sale. Mark Franklin, Montgomery County’s Red Cross Executive Director, accepted the check from Berry and called the effort marvelous and awesome. The Red Cross has been in the process of forming a closer relationship with the College. "I approached the College through (Assistant Dean of Students) Mike Raters last year," Franklin said. "We wanted to seek out two students to be on our board of directors." Homer Twigg ’08 and Larryjoe Brown ’08 joined the board in the spring to serve a three-year term. "We had not had a lot of connection with the College before," Franklin said. "We needed to interface. There are a lot of things the Chapter and the College need to do together." Franklin said disaster preparedness is an area where the College and Red Cross need to understand each other better. "The Chapter and the school need to be working hand-in-hand on many issues. What are the processes of evacuating the College if there is a derailment or hazardous spill?" The local Red Cross leader would like to believe the support for Hurricane Katrina was a result of the improved communication. On homepage and top right: Morillo, Cooper, Berry, Franklin. 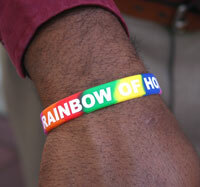 Lower left: Cooper's 'Rainbow of Hope' wristband being sold by the MXI.